Yeah, I know that Earth Day has already passed for this year...I guess I feel like there's a little bit of Earth Day in EVERY day. Or there should be. I'm not going to get too heavy here. Just want to share some images and thoughts that remind me of Earth Day and how much I love being connected to nature. 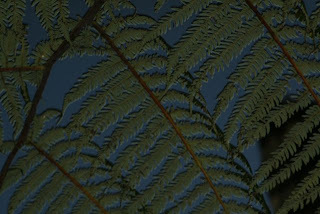 Like the plant fronds above. That's a shot I took on an island in the Philippines, where the natural resources are being exploited at a stunning rate. 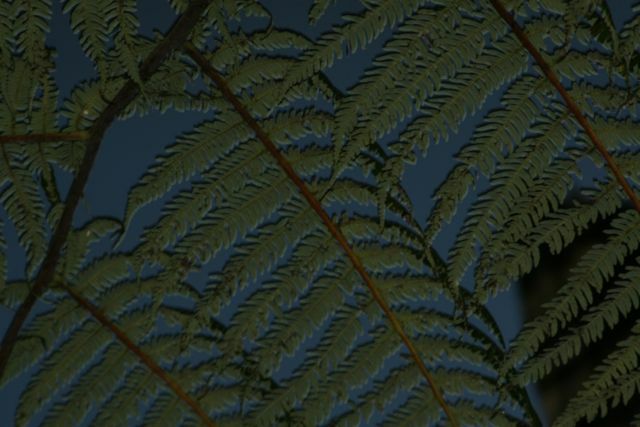 The endemic species there are disappearing... This image reminds me of a fossilized plant, which reminds me of coal and oil...and our consumption of same. 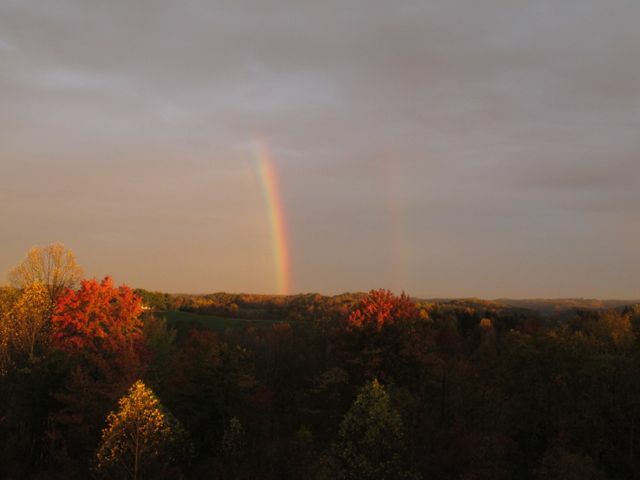 A double rainbow in fall, shot from our birding tower in southeast Ohio. Being up high like this lends us a perspective that we don't get from the ground. It shows the vastness of the habitat in some views, but it also reveals fragmentation and all the things that come with it. In our part of the world we're beginning to experience the impact of hydraulic fracking for oil and gas. I wonder if our beautiful vistas will be the same in 10 years. 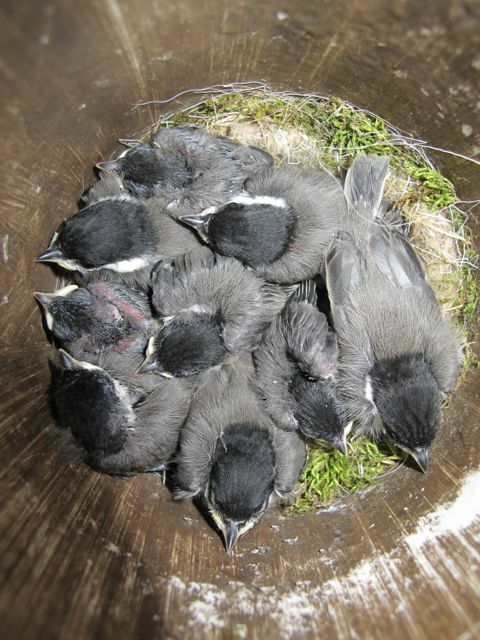 Each spring I get to experience the miracle of the songbird nesting season on our farm. Monitoring our nest boxes is such a treat. To watch birds such as these Carolina chickadees go from eggs to hatchlings to flying tots in just a few weeks—well, it boggles the mind. 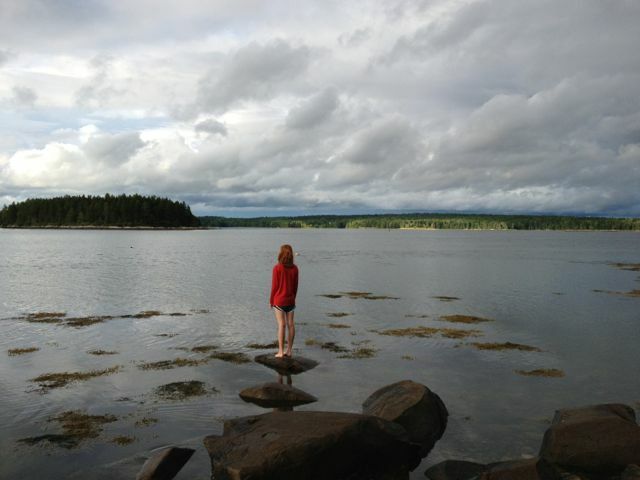 I took this image of Phoebe on Hog Island Audubon Camp in Maine. It wasn't posed. She loved climbing out on the rocks as the tide came in and I couldn't resist the image. Maine may very well be the place that my kids connect most closely with the natural world because it is so very different from the habitat and landscape (or seascape) where we live. I'm just happy they're connecting. And speaking of young people...one of the best things about Earth Day is all the various activities that are available for youngsters to experience—and to connect with—nature. But we don't have to wait to do that until Earth Day NEXT year. Why not invite a young person (or a whole classroom!) 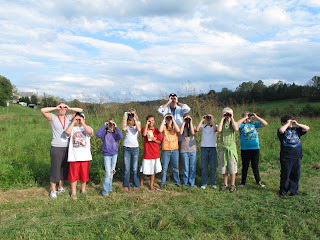 to go outside with you and your birding/nature club or companions. It's the very best way to keep the spirit of Earth Day alive. Tomorrow morning I'll get up before dawn to lead a passel of people on a long hike down the New River Gorge in West Virginia. 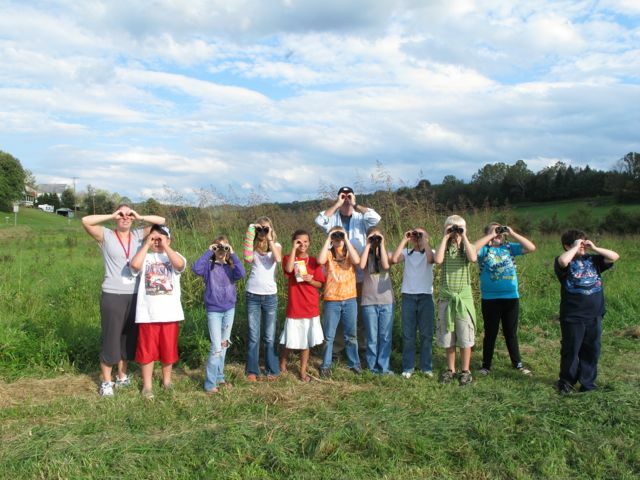 There will be nature fans of all ages—a few youngsters and a many young-at-heart bird watchers. I'll do my best to show them a good time and to let them know why I think this area is so wonderful and special. But, you know, that's true of anywhere, as long as it's outside! Christmas in April: Arrivals Pouring In! This spring every new day feels a little bit like Christmas morning. 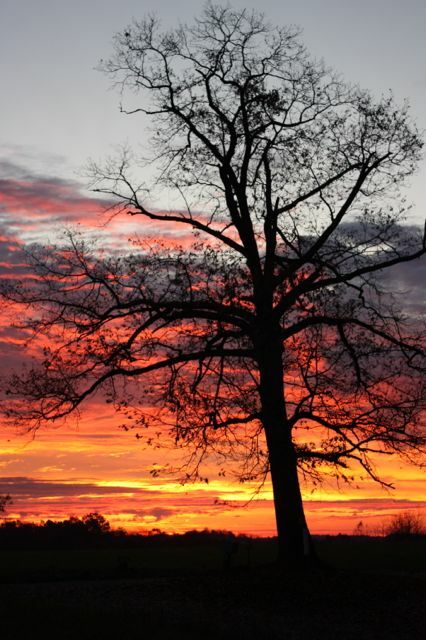 It was a brutal, long, gloomy winter here in southeastern Ohio and springlike weather has been slow to arrive. But now that the insect-eating songbirds are beginning to make their spring appearances, I awake each morning full of anticipation about what gifts may have flown in from the south on the night breezes. This is why it's Christmas-like. Just like every Christmas Day morning for the past five decades, I'm rearing to go and full of "Can't wait!" Often, these last few weeks, my very first thought—before my eyes are open—is: "I'll bet today is the day that the hummingbirds (or tree swallows, or blue-winged warblers, or wood thrushes) get back." 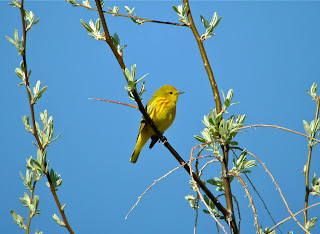 The little, brightly feathered "presents" that Nature brings us each spring—in dribs and drabs at first, then in a marvelous gush of song and color as migration reaches its peak. Oddly our current spring migration has been somewhat inconsistent with our records for returning dates of migrants. Hummingbirds are several days late. Tree swallows are back all around us but ours have not appeared, making us worry about their fate. 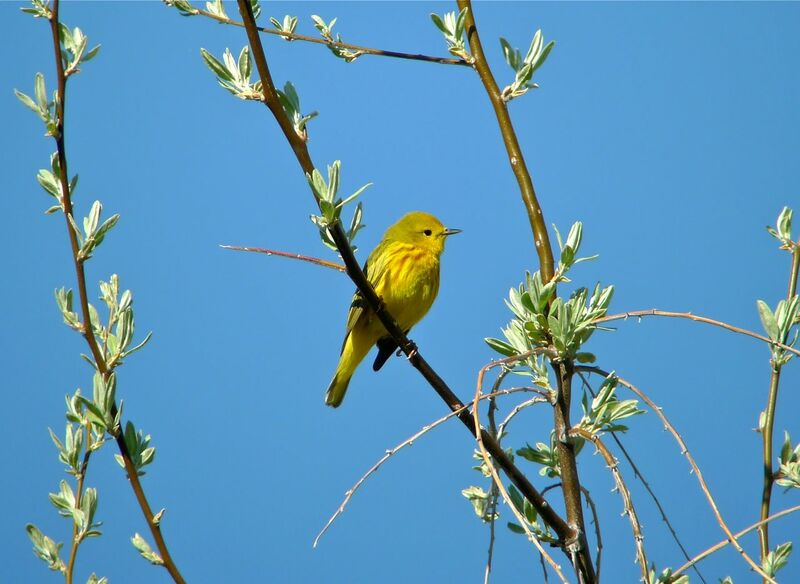 Only a few warblers have come back—so far no tanagers or orioles. It's all right. Let them take their time. After all, the anticipation is almost as wonderful as seeing and hearing an old familiar friend, returned from a winter away from this old ridgetop farm. Singing male ovenbird. Photo by Julie Zickefoose. I was giddy to hear an ovenbird on Monday of this week. His song is so loud and percussive that it's hard to miss. I'm sure he was not back sooner. 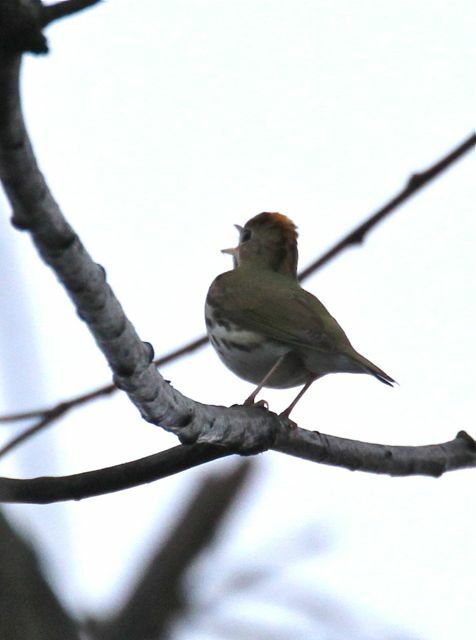 He was drifting around the old orchard to the west of our house, singing half-heartedly. 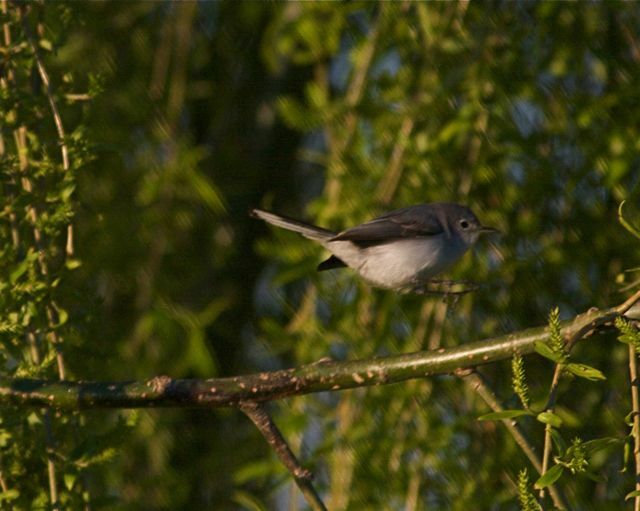 By early May our woods will be ringing with the songs of ovenbirds and a dozen other warbler species. 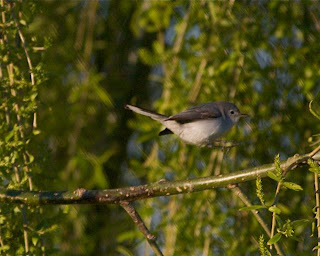 Like the song says: "Springtime, you know it is my songbirds' sing time." And that's music to my ears.